Each and every employee that is involved in a Granite Selection installation has at least 10 or more years of installation experience. Through our combined years of experience as granite countertop installation contractors, we have seen it all, and can therefore swiftly and accurately address any issues as they arise. We take pride in the work that we do. We understand that the granite countertops we are installing are not simply a new surface in your home. Countertops, especially kitchen countertops, are a focal point of a home and are often where families and friends gather to cook and talk. Countertops receive a lot of wear and tear, which is why we ensure your granite installation is as durable and seamless as possible to last through numerous holidays, parties and family dinners. 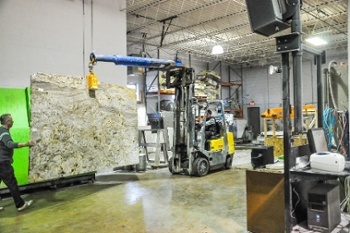 At Granite Selection, we utilize the Asinus 350 Lift System for safe and easy loading, transportation and installation of granite kitchen countertops up to 770 pounds. The advantages of this system for our clients includes considerably reduced body effort, meaning clients do not have to rely on the strength of an individual to safely transport your countertops. Using this system also means that fewer individuals are required for installation, reducing the cost of manpower. The Asinus 350 is also perfect for granite installation in the Chicagoland area. This rig allows for vertical transportation of granite slabs. This provides a wider range of mobility in narrow rooms and alleys with practically no danger of breakage. And, with height adjustment capabilities by an electric motor with high-performance batteries, your granite will be able to be safely installed in any level of your home. Our expert Granite Selection employees use the LT-55 XL Laser Templator to enable our team to come into your home, complete a precision template of your kitchen or bathroom with accuracy of +/- 1/16” for measurements up to 50 feet and move on to fabricating your custom granite countertop quickly and with as little frustration as possible. By using the LT-55 Laser, we ensure your countertops are cut to the exact measurements within your home regardless of curves and oddities. Using this technology, your granite will be measured and cut to perfection, that’s our guarantee. 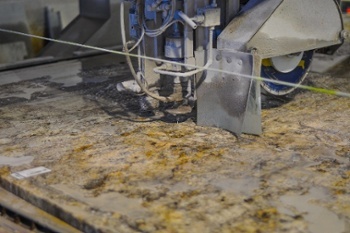 In addition to our use of the LT-55 Lasers, we cut your granite to those precise measurements using a CNC Machine. Using this technology, we are able to provide invisible seams and perfect cutouts for kitchen sinks and other appliances. This means that there is no need for additional cutting or sanding of the stone on site. Other companies bring granite slabs to your home with only the larger cuts made. They then hand measure and cut the stone for appliances and fixtures. This can result in gaps between the stone and the sink or wall and/or undesired edging to try and get the stone to fit. 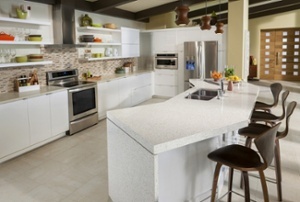 With Granite Selection, you are guaranteed a safe, seamless, machine cut installation with experienced professionals. Visit us online at https://graniteselection.com/ to schedule your free measurement appointment and to browse our wide selection of affordable granite and select granite countertops in Chicago. You can also get an instant quote on your project.